…not created by Gaudi. Our editor and Barcelona expert highlights five sensational buildings by some of the great man’s contemporaries, lest history – and travellers – overlook them. Surely the most beautiful hospital in the world, Lluis Domenech i Montaner had patients in mind when he designed this 13.5 hectare complex in the North East corner of the city. Almost a town unto itself, the hospital has its own streets, gardens and church and the twenty red-brick pavilions, full of Modernista flourishes, are designed to create a harmonious environment for convalescing. They are even set at 45 degrees to the grid pattern of the surrounding Eixample so that the complex catches more sun! (There’s nothing a bit of vitamin D won’t fix). UNESCO-listed since 1978, the original buildings of the Hospital de la Santa Creu i Sant Pau are currently being restored (the aim is to create a museum and cultural centre), whilst the patients have been moved to more modern, albeit less good-looking, facilities next door. 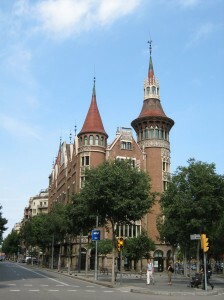 UPDATE: the hospital restoration is now complete and its currently open as the Sant Pau Art Nouveau site. More details on their website below. Montaner once likened his work to that of a conductor: he held the baton and all the artists, such as the glaziers, the sculptors, the carpenters, the manufacturers of mosaics and paving, had to come together in sweet harmony. Well appropriately enough it was he who was chosen as chief architect for the Palau de la Musica Catalana, a building that would promote Catalan song and music as an important strand in the Catalan renaissance that was taking place at the time. Built using Montaner’s trademark red bricks, the Palace serves as a prime example of Modernista magic, with plenty of rich ornamentation in the form of glazed tile mosaics and of course Miguel Blay’s magnificent sculpture ‘The Catalan Song’ bursting out of one corner. The inside is similarly splendid, in particular the inverted dome skylight by Antoni Rigalt. Sadly the Palace finds itself rather hemmed in by the surrounding buildings and is a little hard to appreciate from the outside as there’s not enough open space to get a good view. 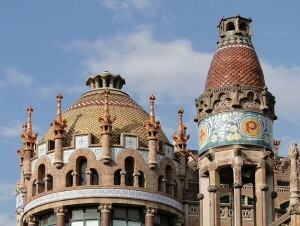 Like any Modernista marvel worth its salt Casa Terrades has earned itself a satirical nickname and is known by Barcelona residents as the ‘Casa de la Punxes’ or ‘House of Needles’ (Gaudi’s Casa Mila is known as ‘The Quarry’ and his Casa Batllo as ‘The House of Bones’). The name derives from the conical spires that Puig i Cadalfach saw fit to adorn this private house with. They give the building a Walt Disney-style castle look and combined with its stand-alone location on Diagonal, near the top of Passeig de Gracia, the Casa Terrades certainly stands out. As the house is now a set of privately owned apartments there’s no admission to the public, however you can still admire the facades with its bay windows, balconies and ceramic panels depicting patriotic motifs. One such panel represents Saint George with the following inscription: “Sant Patró de Catalunya, torneu-nos la llibertat” (“Holy Patron of Catalonia, give us back our freedom”). A rather provocative cry of independence, and a prime example of the Catalan nationalism which imbues every brick of every Modernista building in Barcelona! During the Catalan Renaissance even the factories were constructed according to Modernista principles and when wealthy industrialist Casimir Casaramona decided to build his textile plant on Montjuïc hill, Josep Puig i Cadafalch was commissioned to design it. The result was this vast complex built in the architect’s characteristic Neo-Gothic style, with its bare brickwork topped by Catalan vaults, pinnacles and the square towers. Sadly a nice building doesn’t necessarily relate to a thriving business and the factory closed just 7 years after opening. 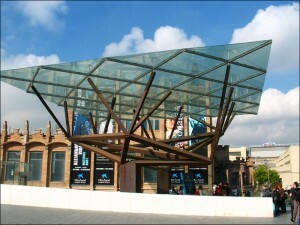 Today La Caixa bank owns the building, where they founded the Caixa Forum, a centre for art and photo exhibitions and other assorted cultural events. 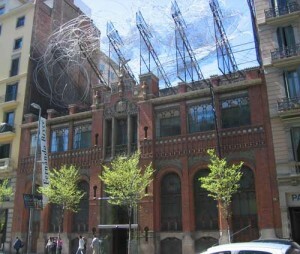 One of Domenech i Montaner’s earliest works (1886), the building was constructed for Montaner i Simon’s publishing house, and later acquired by the foundation of one of Catalonia’s most famous artists – Antoni Tapies. The architect gave the building a Moorish appearance (common in Modernisme), and combined brickwork with cast iron pillars and steel beams for what was a pioneering look at the time and one of the forerunners of the genre. If the edifice wasn’t eye-catching enough as Montaner intended it, Tapies decided to stick one of his abstract sculptures on top, a rather sinister-looking tangle of aluminium piping and metal meshing that gives off a decidedly high security prison vibe. Inside you’ll find more modern art madness by Tapies himself and other Catalan artists. If you want to compare the styles of Barcelona’s great trio of Modernista architects, you can actually see the work of all three side-by-side on the so-called ‘Manzana de la Discordia’ or Apple of Dischord (a nice pun on the Greek saying, incorporating the Spanish use of the word apple, which also to mean block), on the Passeig de Gracia boulevard. Gaudi’s Casa Batllo sits next to Puig i Cadafalch’s Casa Amatller, which is next to Domenech i Montaner’s Casa Lleo Morera. For more info on the Catalan capital in general and plenty of hip recommendations, check out Urban Travel Blog’s juicy city guide to Barcelona. 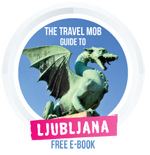 Or drop by our Secret Seven list of things to do (coming soon! ), where we share some alternative attractions of The Great Enchantress that you won’t readily find elsewhere on the Internet. 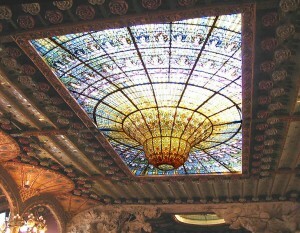 I visited recently Casa Amatller and loved it. Having been born and grown up in the city, i saw it often and always wondered what might it look like inside. So glad they opened it to the public a few months ago! Lovely selection of Modernist buildings!